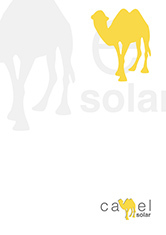 Our philosophy is very simple at Camel Solar. The target of our solar thermal collectors is to have the highest coefficient of efficiency and maximize the energy produced by solar panels. One of the key factors of producing a high coefficient of efficiency is the transformation of solar radiation to heat, allowing for the maximum amount of absorption whilst minimizing the amount of emission. All raw materials used for producing the solar thermal collectors are of the highest quality and highest performance available. We have a dedicated R&D team researching the latest technologies in design and integration, for architectural aesthetics and tailor-made products. We look forward to working with you and coming up with stylish, innovative solutions to meet your individual renewable energy demands. Please feel free to contact us using the links below.